I never had the opportunity or finances to travel on a study abroad as an undergraduate. When I met my husband we put a lot of miles on our car driving from Michigan to Nova Scotia & back through the states one summer, then the following summer, from Michigan to Jasper to Vancouver and then back through the states via countless National Parks. I didn’t have the opportunity to travel overseas until I was 30. I had started my PhD program and began teaching with the MAET program and had the opportunity to teach in Plymouth, England in the summer of 2006. Since then, I have had the opportunity to circumnavigate the globe. As director of the MAET program, I also have the opportunity to provide this chance to others via our MAET overseas program. There is a common agreement that it takes 10 years to become an expert…so…I’m getting close to having this travel thing somewhat down pat. I still learn and hone my strategies, but I feel I’ve come a long way over the past 8 years. This year in our MAET Overseas program, we have a handful of students who like me years ago, are venturing out for the first time. I thought it would be helpful to articulate a few things I’ve been told and learned over the years of travel that I either did very well, or, wish I would have known on that first trip. Experienced travelers coming across this post – please add your wisdom to the discussion! My very first time setting foot on foreign soil was on June 20, 2006. I flew from Detroit Metro to London Heathrow. I had to rent a car and drive four hours from London to Plymouth, England. In 2006, it was not common to have a GPS unit – it was something silly like over 200 pounds to rent one. Thus, I had to rely on a road atlas and a print out of MapQuest directions along with hand-written tips from someone who had driven the route before. Before setting foot over in London I thoroughly researched the route. I read the atlas every night (ok, not every night, but a lot) before bed so I could build a mental map in my head. These were the days before international cell phone plans or easy to procure SIM cards. I really had to know where I was going and what to do if I got stuck. I think this experience set me up for future travel success. Everywhere I have gone, I do the same thing. Now, with international data on cell phones or unlocked phones + a SIM card, it’s easier, but, I never assume that I’ll be able to get online. I always have a good mental map of roads or transport systems I’m going to encounter on my way to the airport, to the hotel, or wherever I am headed. Additionally, delays will happen. Getting angry isn’t going to make your connection happen. My advice here – be on top of alternate plans and have several ways of contacting your airline. Get those ducks in a row BEFORE you travel. Follow the twitter handle of the airline you’re flying. Social media is quickly becoming the go-to tool for customer service. Program the airline customer service number into your phone. If you miss a connection – chances are there is a plane full of people that also missed the flight. This means the counter is going to be busy, busy with angry people. You should be pro-active. Fire up your laptop (if you have one with you) or browse on your phone and look for alternate flights. If you’re flying to Europe, main hubs are LHR, AMS and CDG. A LOT of inter-Europe flights go in and out of there. See if you can find a route that may not come up automatically (you can do this by selecting multi-segment flights) and bring that to the table. They may not honor your request, but, at least you’re trying to get yourself from point A to point B. If you get lost, completely lost, ask for help. If you’re in a country where English is not the primary language, very kindly ask for help. It may be advisable to search out a tourist office (if there is one close by) or at the very minimum, have a map out and show that you know where you are and point to where you want to go (another tip from Andy!) I make it a rule to always learn the words “thank you,” “sorry” and “do you speak English” everywhere I go. I do not make assumptions and always do my best to make first contact in the native language. I’m very happy that I have a working knowledge of French and wish more than anything that I could speak more than two languages. If you read travel forums you will read lots of warnings that pickpockets are everywhere. And, they are. It doesn’t mean you should freak out and look over your shoulder every 5 minutes. It DOES mean that you should be very aware of where and HOW you keep your passport & money. I personally have a messenger bag that goes over my shoulder and I keep the bag towards my front. It’s really hard for anyone to get their hand in that messenger bag. If you use a backpack, do not, under any circumstances, put valuable items in the outer pockets. If you have a backpack I suggest a lock or twist-tie for the large zipper pocket as some one could come by and unzip and spill the contents of your bag. While you’re trying to pick everything up, the pickpocket team will be there waiting to pick your things up too. 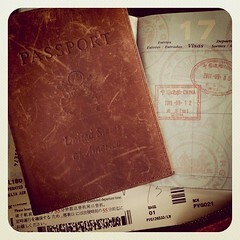 You should only need your passport a few times when you travel. You will need to show your passport at the airport coming to and from your adventure. Also, you frequently have to show your passport at a hotel. At all other times, your passport should be in a place that is hard to reach. Do not let anyone keep or take your passport. Once I’m done showing my passport, it goes in an inner pocket of my bag that is not easy to reach. As far as carrying money/credit cards – I keep those in my wallet, also in the messenger bag. However, when I’m in a train or bus station – I keep the small amount of money I need to pay for the ticket, or my single credit card if I’m paying with a card, in my front pocket. (I know how much to expect because I research ahead of time.) This way, I’m not fumbling around taking money out. When I get to the ticket window or machine I take the small amount money out of my pocket, pay, and get on the bus/train. I can put the change away later when I’m safely in my seat. If someone is sitting next to you, it’s wise not to flash your money or wallet there either. It’s the moments of vulnerability that the pickpockets are watching for – just be confident and know where your money is AND how to use the machine. If you’ve never used a ticket machine, google it! (Here’s an example of all of the amazing help at your disposal.) Even better, look up the transportation site for the country or system you want to use – they all have FAQ/help guides. Get those in your head BEFORE you leave so you don’t have to stress, you’ll have an idea of what to look for as you encounter new systems. As you’re preparing ask yourself, what questions should I be asking myself? When you formulate those questions, Google them! What type of power adapters do they use in X country? How much is my overseas data plan? Just like you need to get yourself from point A to point B, a lot of your preparation can be done with research. You can certainly ask others for help, but, a wise man once said “Don’t ask me questions that can be answered by Google.” This is not meant to be off-putting. A lot of travel advice is just that, advice…you shouldn’t just take my word from this blog post – Google around, what do other people say? There are lots of people with lots of opinions – triangulate them to make your own rules of the road. It’s almost a challenge for me now to see how light I can pack. It’s liberating. Just travel with a carry on if you can, however, for my summer travel where I’m staying in a country for over a month, this just isn’t possible. I still try to pack as light as possible, making sure I have climate appropriate clothing (Google it if you don’t know what to expect) and lightweight layers. I use the bundle wrapping method for my clothes. If you’re staying for a long time that means you’ll have access to coin laundry or a laundromat. I have recently found it less expensive to use a laundromat, especially in Europe as the washers just don’t seem to dry things out. If you do send your clothes away, understand that they may not take the same care and attention that you do – so any special garments that you don’t want to shrink, hand wash those. I purchased a very inexpensive hairdryer for Europe since voltage conversion can be messy with devices like hair dryers or curling irons. I’m a techie traveler – and this is where the “pack smart” comes into play. I make sure I have the cables to charge all the devices. Also, since technology is the core reason I often travel, I make sure to have a few back-up cables. (Since it’s super high stakes, I even have a back up laptop for my summer work.) I keep everything as neat and tidy as possible, so, if I need to go into my laptop bag when traveling I don’t have junk falling out all over the place (see “be aware”). I love to look at “what’s in my bag” posts (like this one http://kk.org/cooltools/archives/14659) I always learn a new tip or trick. I have found it extremely valuable to use social media to document my journeys – it started with Flickr and has moved on to twitter, Facebook, blogs, etc. Here too, use common sense – I don’t publish the name of the hotel where I’m staying (at least not while I’m there.) I frequently contribute to TripAdvisor and Yelp because I find those sites very valuable when I travel, so, I’m giving back and offering my opinion as well. Plus, by documenting all of my trips, I can help others who are going there as well and fondly reminisce about all of the incredible adventures I’ve been able to experience. Great tips, Leigh! I’ve found apps like TripIt to be very helpful in organizing my agendas and the location of various things. Confirmations come in from airbnb, airlines, hotels, train tickets, etc. and then TripIt crawls through my email looking for them and puts them into the app for me along with maps and locations. It has a few hiccups now and then, but it’s easy to edit the things once they are in the app. And it’s all accessible offline once it’s in there. That brings me to another point – when you have wifi, download anything you might need or want because you never know when you’ll get the chance again. It’s like the digital version of topping off your gas tank. I also use Evernote to store things like my frequent flyer miles numbers. I also have my doctor info and prescriptions in there. Depending on where you travel and the medications you take, you can run into trouble. I would google the country and info about traveling with certain meds just to make sure you don’t run into any trouble. I always register with the U.S. Embassy before traveling overseas (https://step.state.gov/STEPMobile/Help/Help). STEP makes it easier to get a replacement passport, allow the U.S. to intercede on your behalf if you are arrested or imprisoned, and they’ll even loan you money to fly home if you get robbed or run out of cash. They will also email you reports on dangerous weather and political unrest in the specific country you’re visiting. And it’s free. A no-brainer. Very helpful, Leigh! I would just add this: When packing your carry-on, make sure to always add a change of clothes. You never know when you might get stuck in an airport somewhere because of a cancelled/delayed flight. Nice work here, Leigh. It’s hard to stay so concise with such a huge, exciting, and daunting topic. Here’s my second go at responding–and, Mary took most of my answers! :) I hope I can offer some help. After about 13 years of being out and about in the world, six of them living overseas permanently, I’ve learned that while you get more comfortable traveling, communicating and being a foreigner, there are ALWAYS surprises–just when you think you got it all under control. And it took me a long time to realize that that is okay to be blindsided like that. It’s all part of my adventure when I decided to leave the U.S. I’ve gotten comfortable with being uncomfortable basically. Something else I do now to cushion the stress of those surprise-extreme-overseas-disaster-days, is to do something nice for someone else–particularly, the person who has just helped me out. I carry small, local gifts in my purse when I leave home just for that reason. When I have had to rely on help from strangers, they really are surprised when I offer them a unique token of my appreciation. Once I even got a small gift in return for my little gift–even though the shopkeeper had just let me borrow his cell phone multiple times! I also can’t stress enough how important landmarks and “friends” in the neighborhood are. When directions and technology let you down, you can remember and rely on familiar faces, images and stories! As you move around a city, you really have to keep a mental log of colors, signs and noticeable buildings. I once found a lost friend in Istanbul (18 million) because of a “big, green, box-thing around a building, by a bridge”! Also, the more willing you are to get-to-know a local (within reason, of course), the more willing they will be to help you later, when you might need it.